"Architecturally Intel's Z68 chipset is no different than the H67. It supports video output from any Sandy Bridge CPU and has the same number of USB, SATA and PCIe lanes. What the Z68 chipset adds however is full overclocking support for CPU, memory and integrated graphics giving you the choice to do pretty much anything you'd want." Premium motherboards come with lots of nice bells and whistles. From overclocking (Overclocking is an OK feature now?) to hardware acceleration. I find Intel's Smart Response Technology interesting though, which sounds a lot like a souped up ReadyBoost. 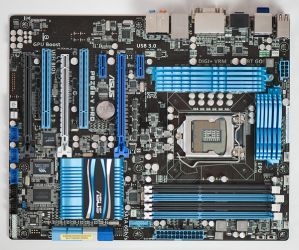 I also have to wonder whether someone who is interested in a high end motherboard such as this would be skimping on their storage options. I would most likely already be using a SSD as my system/application drive and use high capacity HDDs for media.